Rohrspatz & Wollmeise – Ziggurat Book PARTY! Note: My workshops in Germany are held in English und Deutsch in an unholy mixture. You may ask questions in German and I’ll come up with answers in some kind of German if need be! Fragen auf Deutsch sind willkommen, Antworte, Erklärungen und Beispiele werden mit Freuden auf die selbe Weise versucht. I’m trying to make arrangements for North American distribution. Stay tuned… THANK YOU for asking! Hi. I also live in CA (Sacramento) and just discovered you watching the Fruity Knitting vlog from this summer. 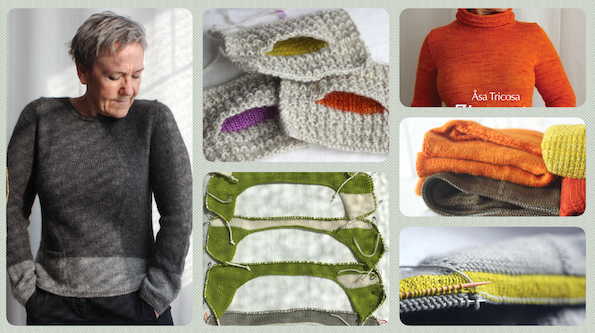 Looking all over Ravelry and your site, I have not seen any hints of how up size up your amazing garment patterns. Do you have guidance for increasing from bust size 50” to 52” (and how to add a bit of positive ease to the patterns)? Would love to work through several of your patterns in the book but hesitant to purchase it until I have a sense I could manage the size adjustments. I have been an avid knitter for most of my 69 years. My Grandmother taught me at 5. The advent of the internet and Ravelry have made an explosion of new, innovative knitting techniques. I saw the interview with you on Fruity Knits and can’t wait to conquer some of the shortcomings of top-down knitting. Can’t wait till it’s available in the US. Great work, Åsa! Hello Peg! Yes, in some ways the internet is a true godsend. And yes, isn’t it just wonderful that even after a lifetime of knitting, there are still new things to learn, discover, or invent. THANK YOU for your kind comments! I’m another American who is fascinated by the Ziggurats technique that I saw you discuss on the Fruity Knitting podcast. I’m anxious for the book to become available to us here in the United States so that I can try this method of sweater construction. Thank you for sharing your innovative work with us. I’m glad you are! I’m rather fascinated myself – even after so many years of Ziggurating. I still get a thrill from casting on and seeing how the shoulder caps take shape. A bit silly, but true! Looking forward to you book being distributed in the US!